Now you know concrete is versatile. 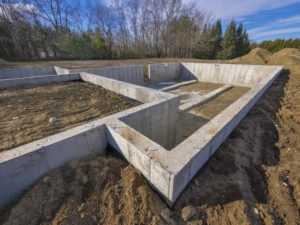 One of the most common uses of concrete is using it when making a foundation for any structure. Especially your new home! Let´s consider the steps involved when you are building your custom made home or when a builder makes the model you choose. With modern technology, we have these huge machines to do the monster work. You will need to hire a licensed excavator to prepare the land. Depending on what type of land you have, you want to build on solid ground. Many do a ground survey before deciding on what type of foundation is needed to have a stable home. Footings are part of your core structure. They are created by forms that help make the shape of the concrete. They are the load bearers for the walls and posts. The size of the footings will vary depending on the design of the house. There are wall, column and stepped footings. Wall footings support the weight from the walls. The columns support the posts which in turn the beams that support the floors. The steeped footings are for sites that have sloped sites. Once the footings are good, the forms are taken off ready to pour the walls. A form is also installed for the walls. There are various types of forms and your builder will know which kind to use. Once the walls are ready, the forms need to be stripped off. Now the most important part for you basement is the waterproofing. This requires applying a product that produces a thick sticky tar-like substance that cures and acts as an impenetrable membrane. This is guaranteed a dry basement. After, installing a draining tile is essentially as important. This guarantees any water that seeps into the soil to drain away from the foundation, preventing any water or moisture damage to enter in your home. Finally, once the drainage system is installed correctly and the waterproofing has been properly applied, the concrete is poured. You will have to wait a few days to make sure the concrete is fully dry or solidly in tack before continuing further. Once the installation of the subfloor is complete, this is when the area around your foundation will be backfilled. When the soil is put back around the foundation it is graded in a matter that it slopes away from the foundation. Now you are ready to build upwards. Building your own home can be very stressful but with the help of choosing the right contractors to do the job you will end up with a priceless, satisfying feeling.